With Easter just around the corner you might be looking to buy the usual chocolate eggs for your family and friends. I can't resist an Easter egg so I admit I do buy a few extra at this time of year that invariably get munched way before Good Friday! 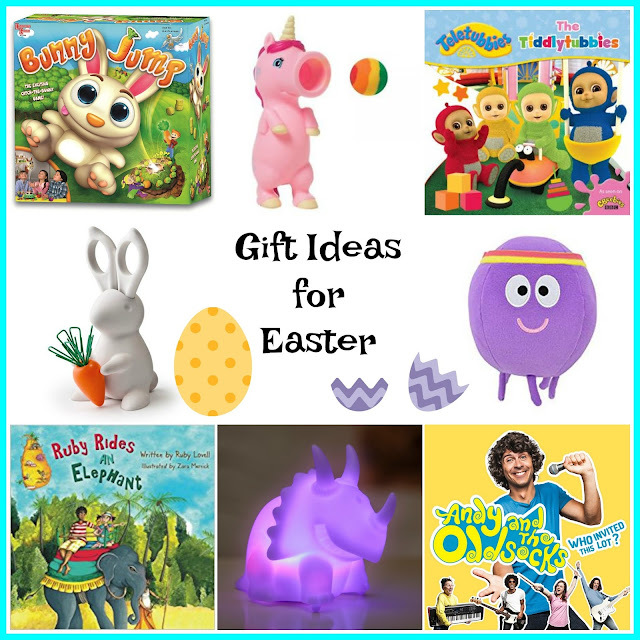 I have bought Elliot and Erin a chocolate egg this year (well, a chocolate dinosaur in Elliot's case) but I have been on the look out for a few non-edible gifts too. They're bound to get a few more eggs so it's nice to have a couple of gifts that don't require eating!! Squeeze Poppers (RRP £7.99) - Elliot got one of these for his birthday last year and it was an instant hit. Load the foam ball into the creature's mouth, squeeze and fire - hours of fun! We have the dinosaur popper but I think we might have to add to the collection and get the unicorn one too! The Tiddlytubbies book (£4.99) - Perfect for the younger children, this lovely hardback book features the adorable Tiddlytubbies in their very own story. Erin loves the Teletubbies and I have a feeling she would love this book! Hey Duggee Talking Betty Toy ( £6.99) - Both my children are a bit obsessed with Hey Duggee at the moment and I know they would love one of the talking Squirrel gang. This one is called Betty and she's an octopus but you can buy the whole gang! Ruby Rides and Elephant Book (£6.99) - For something a little different, this beautiful book would make an unusual Easter gift. Written by Ruby Lovell, it is inspired by the bedtime stories of her childhood and her visits back home to Sri Lanka. A lovely way to teach children about different cultures...and who doesn't love elephants! Colour Changing Dino Lights (£12) - Elliot always sleeps with a nightlight and I know he'd love these dinosaur lights. With three in a pack, they can be positioned around your child's room and gently glow through a variety of shades. They are battery operated too so no need to worry plugging into a socket near your child's bed. Andy & The Odd Socks CD - Who Invited this Lot? - This has been on repeat since the moment we got it and has been a massive hit with the small ones in my family. Featuring Andy Day from CBeebies and his band the Odd Socks, you will be unable to resist tapping your feet to these songs and I guarantee you'll be humming the Alien song for days! !